After the US put the massive M103 series heavy tanks into service, changes in ammunition and other events such as the rise of antitank guided missiles soon meant that sheer penetration capability by brute force (e.g. bigger guns) was becoming obsolete. As a result, the US Army soon retired their M103/M103A1 tanks when the M60 series began to be fielded. The Marine Corps, as always on the short end of purchasing and development, was offered the remaining M103 series tanks but with the same upgrades to their drivelines that the US Army was doing with its M48 series tanks; a new AVDS-1790 series diesel engine, new rear hull and exhaust system, and other internal changes. The Marines accepted the tanks and also added one thing they had used faithfully since WWII: an external telephone box at the left rear of the tank. 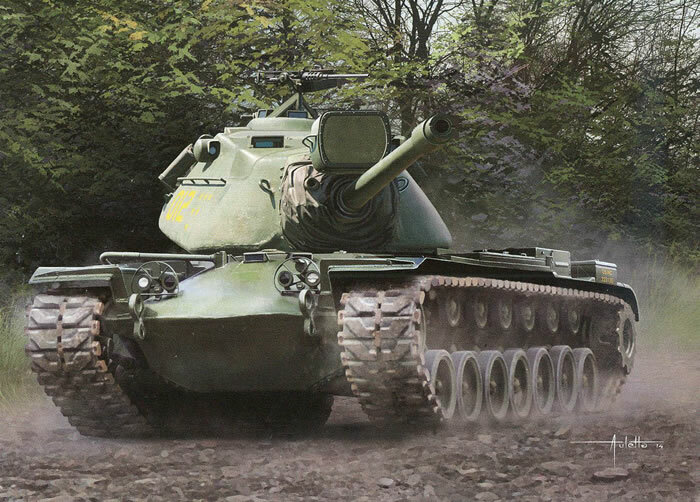 Eventually the Marines converted and received 206 M103A2 tanks, but even by then they were considered reserve tanks. They served there for a number of use and were eventually retired for use as either scrap or range targets. DML released the first 1/35 scale styrene kit of the M103A1 in January 2014, but it unfortunately was apparently hurried in its development and presented modelers with a number of errors and mistakes. It omitted a canvas mantlet cover and the large heat shield which went under the turret bustle to protect the commander from being “slow cooked” by the exhaust. The gun barrel was some 16mm too short, and the engine deck did not fit properly into the area where it was supposed to fit; this also prevented it from easily being swapped to the similar DML M48A3 kits to convert them back to M48/M48A1 configurations. After measuring the components, the model is not too bad as far as it goes. What you get in the kit is a good model of an M103A2 tank without any in-service modifications they sported. There is no mantlet cover (here with the use of the M48-style accordion-style shroud and a much tighter fit); however, as the exhaust on the A2 was routed out the rear gratings, the thermal shield that was a mandatory fitting under the turret bustle on the M103 and M103A1 is not needed so is not provided. The kit assembles in normal fashion (e.g. starting with the suspension). While the drivers (C16) do not have the mud clean-out holes this is an error as by the time of the M103A2 they did have them. The engine deck and hull rear are separate, and in this case they are used with the M48 style fenders with external “side loader” air cleaners on them and new fender braces. The telephone box (part I3) is also provided for Marine tanks. A good deal of the suspension parts come from the M48A3 Mod B kit (DML #3544) and provide their more accurate road wheels with the separate tire/rim and backing plate. Tracks are DS Plastic with a good three-link connection section so getting a good fit should be relatively easy. The kit comes with the machine gun sprue from the M2 Halftrack kit and provides for a very nice M2HB installation, which is good as the mount on the M103 series cupola is quite prominent. The travel mounts for the machine gun (e.g. once removed from the cupola and stowed for movement in order to lower the height of the tank) are still missing. And, as many people have asked, the gunner’s hatch is molded shut; there are no options. Finishing instructions are provided for two “Unidentified” tanks in USMC green: both are from Guantanamo, Cuba, in 1970 (apparently yellow 012 and yellow D24 with what looks like a 1st Tank Battalion shield on the air cleaners). A small sheet of Cartograf decals is provided. Overall this can be built into a reasonably good model of the M103A2 if the gun barrel is replaced and a mantlet cover added. It is a shame that DML did not pay attention to the negative comments received by the earlier M103A1 kit and fix them before this release.